Sometimes watching a movie is sort of like watching a train wreck in slow motion, as if a child has set up a train set so that several trains will all smash into each other. 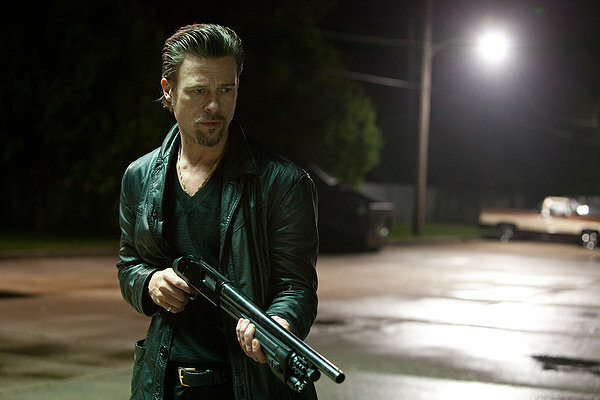 “Killing Them Softly” is a movie like that. We know from the moment we meet most of the characters that they are doomed, that they are going to make bad mistakes and follow them up with more, and that the character who’s likely to come out on top is the one who makes the fewest stupid decisions. You don’t watch movies like this to find out what happens so much as to appreciate the artistry of the train wreck. The trains consist of a pair of small-time criminals (played by Scoot McNairy and Ben Mendelsohn), recruited by a slightly less-small-time criminal (Vincent Curatola) to rob an underground card game. There’s a complicated reason that this will theoretically work, but unfortunately, they are none of them quite smart enough to keep from messing it up. When the card game is robbed, all the local underground card games have to shut down — and that results in the criminal powers that be losing a lot of money. They do not like losing money, so they order their agent (Richard Jenkins, in a perfect bit of casting) to get it sorted out. He winds up hiring Jackie (Brad Pitt) to find out who robbed the game and help deal with the public relations disaster that is slowly building in the underground community. Writer/director Andrew Dominik has given us a gangland thriller which doubles as heavy-handed political allegory — but the movie feels like a cinematic Rorschach test rather than a message on a platter. It’s election season in “Killing Them Softly,” with McCain and Obama posters are everywhere, and their ads and speeches on televisions in bars and airports. The financial crisis is starting, and public President Bush’s speeches on the subject are on TV too. The analogies between the criminal economic crisis and the national one are incredibly obvious — but the point Dominik is making is somewhere between subtle and unclear. It makes for a thought-provoking film. The performances are amazing. James Gandolfini plays a hit man brought in to help out, a guy who used to be the best but is now facing another stretch in prison, drinking way too much, and almost unable to leave his hotel room. His wife is talking about divorce, he can’t stop hiring and then arguing with hookers, he’s a mess. The scenes between Pitt and Gandolfini reward close attention. Both men offer us such layered performances, it’s an absolute delight. Ray Liotta, whose character (the fellow running the card game) spends most of his screentime having incredibly unpleasant and graphic things done to him, delivers a performance that impresses. He’s playing a guy who’s smart enough to see his doom coming, but not smart enough to see it before it’s too late to avoid. This is a movie made for people who love movies. And I don’t mean people who love to get some popcorn and watch things blow up for two hours, I mean people who are interested in sound design and cinematography, in the way the director uses angles and unsaid words to create atmosphere. It’s an ugly story, full of absurd and depressing moments. It’s most assuredly not for everyone. But the people it is for are in for an incredible time.